All over the world, dams are constructed and operated to serve multiple purposes – including flood suppression, clean power generation, water supply, and recreational activities. However, because of the nature of these installations, at times safety can be a major concern. Today we’re going to look at how the Internet of Things (IoT) can be applied to extend the effectiveness of dam safety programs implemented by owners and operators to combat these risks. In recent years, sensing technologies have made constant advancement – becoming increasingly effective tools for monitoring many characteristics of a dam’s health. Effective ways to connect and automate these sensors, however, have been prohibitively expensive and difficult to implement – severely limiting adoption. IoT solves many of these technological limitations and makes it much easier for an owner to implement targeted instrumentation as a foundational component of their risk management program. It’s easy to think of dams as structurally sound installations that aren’t prone to failure, but history shows the deadly impact of dams that don’t address problems before they get too severe. When you look at the data, it can be more than a little troubling. The Association of State Dam Safety keeps records on all of the dams in the country, which illustrate the importance of having high-quality safety protocols. Over 15,000 dams in the US are considered “high-hazard,” meaning that a failure is likely to cause loss of life. 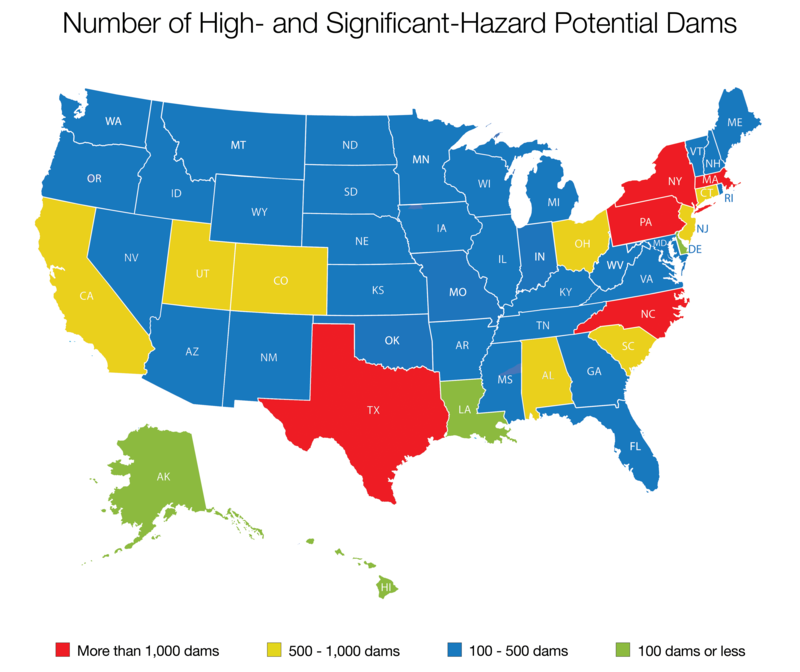 A large portion of communities in the United States are in close proximity to at least one high-hazard dam. 69% of dams in the US are privately owned, and frequently those owners don’t have the financial resources necessary for adequate dam maintenance. The impact of a dam failure event can be catastrophic: In 1889, the Johnstown Dam failed, causing over 2,000 deaths. It’s still the worst dam incident in US history. More recently in 2017, heavy rainfall caused considerable damage to the Oroville Dam Spillway resulting in 188,000 people being evacuated from the downstream community. With the understanding that dam failures can be potentially catastrophic, it’s essential for dam owners and inspectors to implement tools that effectively and proactively reduce these risks to people, and the environment. 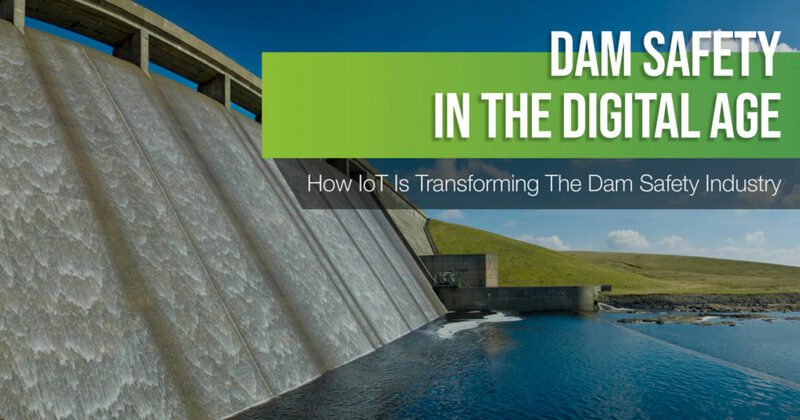 To understand the impact IoT is having on dam safety, let’s break down the various potential failure modes that these structures face and how sensor networks providing continuous surveillance can mitigate these problems. Foundation defects, including settlement and slope instability, or damage caused by earthquakes, have caused about 30 percent of all dam failures in the United States. This is compounded by the fact that many dams advancing in age. Although the construction processes used to create them were designed to hold up for many decades, many are now nearing the end of their intended lifespan. According to the ASDSO, the current average age of US dams is 56 years old. Thus it’s imperative that owners regularly perform comprehensive inspections of these structures to verify stability of the dam – and identify and react to early indications of compromising structural behaviors such as cracks, subsidence, or subsurface movements. How IoT Can Help: Although it’s not feasible to install permanent sensors on every square inch of a dam, safety inspectors are now able to go much further than simply identifying developing structural vulnerabilities and prescribing programmatic visual inspections. Intelligent, and connected sensor technologies are able to monitor structural performance with much better precision than can be performed manually by crews, and with much lower cost than ever before. Precipitation events are a primary driver of hydraulic failures. Rainfall, snowmelt, and other environmental factors can lead to excessive surface water flows into the reservoir, during which water flows and levels have to be actively managed. In many cases site inspectors have to not only pay attention to weather patterns in the immediate vicinity, but they have to monitor its impacts on the entire watershed and coordinate with upstream water systems to properly manage inflow, reservoir capacity, and outflow rates. In some regions, this is further complicated by regulations requiring prescribed seasonal outflows for maintenance of fish habitats. These operational concerns, compounded by climate change causing worsening weather events and longer droughts, creates an ever increasing set of challenges for dams operators across the country (and the world). Additionally, water can be one of the most corrosive elements, especially when we’re talking about, rock, dirt, metal and concrete. Although water is going to be prevalent all throughout the dam, there are certain areas where water shouldn’t exist. Thus, if leaks or seepage is detected – immediate action is often required to prevent potential disasters. How IoT Can Help: Fortunately, low maintenance, solid-state weather sensor networks can be deployed cost-effectively over large areas using recently developed IoT technologies. Dramatic increases in power efficiency have reduced the size and cost of power systems. Resilient wireless, cellular, and satellite connectivity edge devices has dramatically increased system reliability. Edge computing and more efficient communications and management protocols have made sensor networks more dynamic and effective during critical events. Additionally, sensor networks tracking moisture, groundwater, and seepage placed in strategic areas in and around the dam can quickly identify changes in day-to-day performance of the structure. Malfunctioning gates, conduits, or valves can cause dam failure or flooding both upstream and downstream and account for about 36 percent of all dam failures in the United States. Spillways and outlet structures are a crucial element of any dam, and if managed properly allows operators to manage reservoir water level and prevent overtopping. However, over time, either the entrance or exit to these structures can be obstructed or compromised, posing a significant threat to the safety of the dam. Common obstructions are sediment accumulation, and environmental debris. Typically speaking, if the spillway isn’t working properly, or it contains standing water for extended periods, it can corrode infrastructure faster, leading to further risk of failure. Thus, it’s imperative that blockages are removed as quickly as possible. Additionally, as our dam infrastructure continues to age, it’s need for constant inspection will only become more critical and difficult to perform at the scale needed. The remote location of many facilities further compounds this problem and the effectiveness of a workforce tasked with managing these assets. A profound change in approach is needed to address this worsening problem. How IoT Can Help: As you can imagine, being able to remotely record and analyze data consisting of remote sensing, and networks of embedded sensors at various points in and around the dam enables workers to perform virtual inspections at any prescribed frequency, or immediately in response to any identified need. All without deploying any workforce to accomplish the task. In addition to the considerable cost savings that this implies, the additional benefit of timely identification of problems drastically reduces the risk of major damage to the structure, and can meaningfully extend the effective life of our water infrastructure. Technology can greatly assist dam owners with cost-effective maintenance and management of their structures. Since the majority of more than 80,000 dams in the US are privately owned and operated, cost will be a driving factor in the decisions made about managing these structures. Quick and responsible adoption of IoT and associated sensing technologies will greatly improve the safe operation of our nation’s dam infrastructure, while in many cases meaningfully extending the effective lifespan of these important structures.